Shangri-La Villingili is a stunning private island honeymoon resort in the Maldives, surrounded by a pristine turquoise lagoon full of incredible marine life. From fantastic snorkeling and rejuvenating spa treatments to romantic sunset dinners and awesome island golf, the resort is a luxury getaway for the senses. The private island is larger than many other island resorts in the Maldives, offering honeymooners plenty to explore, from secluded beaches to jungle spots in the middle of the island. Ask for a Jungle Dinner experience, a favorite with couples looking for a quiet hideaway among the trees. The island boasts 3.7 miles of picturesque coastline and 1.2 miles of beautiful white sandy beach. Ocean views from overwater villa bedrooms are some of the best in the world. Wake up surrounded by the blue lagoon to the sound of the waves and have a delicious breakfast on the deck over the water. In addition to the water villas, couples can stay in a tropical tree house with a spacious outdoor deck and an infinity pool with spectacular island views. 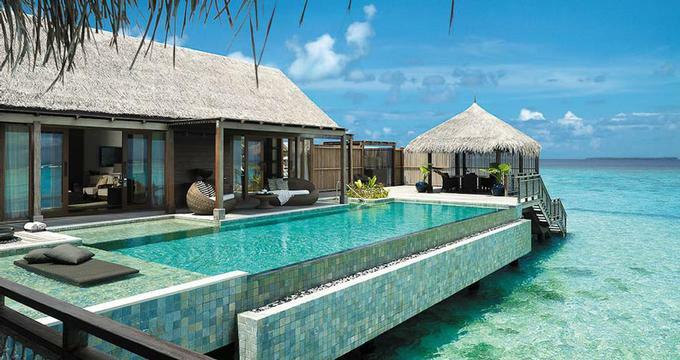 Click here for more great luxury honeymoon villas. Dr. Ali's has three Eastern-style living rooms representing the different cultures and cuisines of the Indian Ocean, the South China Sea and the Arabian Gulf. If you want a romantic sunset dinner, head to Fashala which serves fine dining cuisine using local produce from the ocean and nearby farms. You don't have to worry about going hungry on your island honeymoon. In addition to 24-hour room service, Javvu restaurant is open all day long. In the evening, have drinks and watch the sunset from Endheri or head to Manzaru, two stylish beach bars. The island has a health club offering fitness classes and personal training sessions. Take a bicycle tour and see the who island. Stop and have a beach picnic on a secluded beach. Facilities on the private island include a Cool Zone, Scuba Diving Center, swimming pools, tennis courts, water sports and even a golf course. Chi spa offers an array of rejuvenating treatment in beautiful overwater pavilions. The spa complex is its own private spa village within the resort. The spa has a yoga pavilion overlooking the Indian Ocean, and individual treatment villas with private gardens and steam rooms. The resort has a 9-hole golf course with spectacular views of the turquoise lagoon. Great for beginner and expert golfers, this private island golf club is one of the few in the world. The Club House offers light snacks and refreshments, and a Pro Shop that carries an assortment of golf apparel, gear and merchandise. Villas start at $1,050 USD per night.